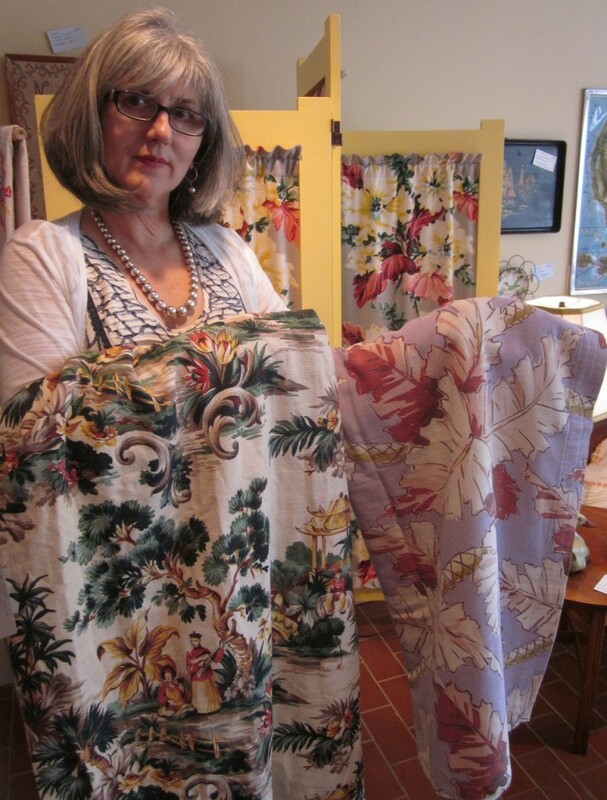 Tomorrow, Wednesday August 21st at 2pm at Mrs. Nicholson Home, I will be giving a free talk about vintage fabric, discussing how architecture, technology, isolationism and the movies influenced North American fabric design. The emphasis will be on barkcloth – my favourite fabric! Here I am holding a piece of 1930s “columnar” barkcloth (the mauve fabric) and a piece of 1950s “Oriental” barkcloth (the green). In between, on the screen, is a 1940s “tropical” pattern in vibrant yellow and red on a grey background. Holding up some vintage barkcloth pieces in front of a three-panelled screen with vintage barkcloth as well. « Paint the Town and Arts Unleashed!